After choosing the right rack, it is key to put it in the right place so that it is useful and safe for all. Convenience is key – bike parking must be on or visible from the route the bike user takes to access the premises it services. The safety of bikes, bike users and especially other pedestrians is vital. Short stay or Long stay? Short stay bicycle parking will be used for 3 hours or less. It must be conveniently located and satisfy all the basic requirements contained in this guide. It is commonly known as ‘visitor’ cycle parking. Long stay bicycle parking will be used for 3 hours or more and may be found in workplaces, residential buildings and public transport stations. Stands shall be securely anchored to an immovable object. Racks are generally either surface mounted with tamper-proof secure fittings or set in-ground into a concrete footing. Asphalt, tiles and other shallow surface treatments are unsuitable. Quick-set concrete is not recommended because it has a tendency to swell and can damage the pavement surface.. Visual impairment features Tactile surfaces can be used to help mark bike parking to visually impaired pedestrians. Refer to AS 1428.4 and RTS14. Ideally the rack shall have a ‘tapping’ horizontal element at about 100mm or less height (measured from the finished path surface) that can be detected by a person with a cane. Locked cages provide high levels of security for long-stay users. Visitor bike parking is located next to the main entrance and is so popular more is needed. Easy to find and access Visitor cycle parking facilities shall be clearly signposted or visible to cyclists entering the site. Preferably a location which can be ridden to and also provide convenient and safe access from surrounding bicycle routes and main entry points. Surface markings work well to direct users to bike parking and provide a clear route. Pedestrian safety Consider the safety of mobility or vision impaired pedestrians. Locate racks so that parked bicycles don’t block the pedestrian path. This may be off the footpath or in the ‘street furniture zone’. Protected Cycle parking facilities shall be located so that the bicycle is at no risk of damage from vehicle movements within the site. 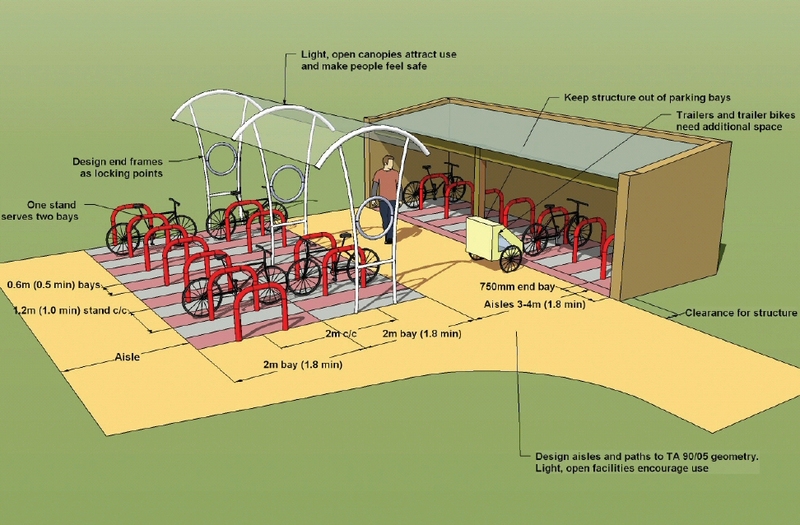 Unobstructed Cycle parking facilities shall be available during the hours of operation and shall not be diminished by the subsequent erection of any structure, storage of goods, or any other use. Proximate Cycle parking facilities shall be located as close as possible to and no more than 25 metres from at least one main pedestrian public entrance to the building/activity. An exception could apply to a building on a key pedestrian frontage that has no setback from the road frontage, which results in there being no space for the visitor cycle parking to be provided within 25 metres of at least one main pedestrian public entrance. (visitor parking). Security and safety The location should enable adequate surveillance (passive or electronic) and/or physical security so as to deter and prevent bicycle theft and assure personal safety. Security measures may include: CCTV cameras, location in well trafficked locations, located in highly visible locations, close to on-site manned security, locked/restricted access for long stay bike parking (e.g. bike parking cages). Lighting Bicycle parking areas should be well lit for theft protection, personal security, amenity and accident prevention. A recommended minimum level is two lux, with high uniformity, during the hours of operation. Weather protection Whenever possible protect bicycle parking area from weather. We recommend that you use an existing overhang or covered walkway. Alternatively, construct a canopy or roof — either freestanding or attached to an existing building. 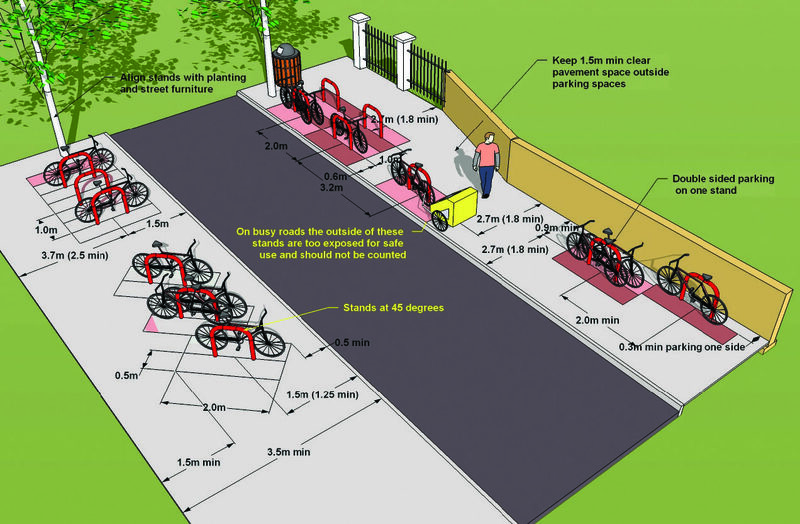 Contour / Slope Cycle parking should always be placed on level ground. 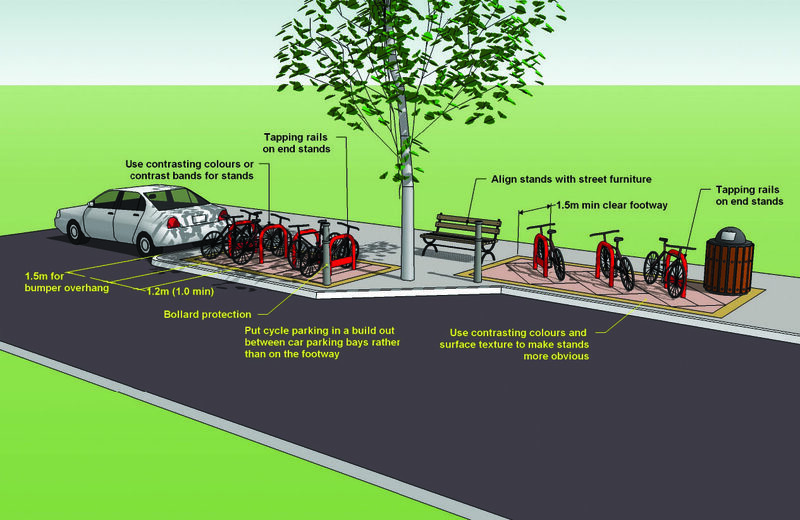 Where this cannot be achieved, the racks should be aligned parallel to the contours so that bikes do not tend to roll down the slope. Appeal Attractive, obvious, clean and well maintained cycle parking will deter anti-social behaviour, and to make users feel safe and welcome. When bike parking is not provided close to where it is needed, improvised bike parking can create hazards for other users. Locked cages can also be installed in under-ground carparks for long-stay users. Cages can be fitted to utilised spaces such as this one at the carpark entrance. Problem: Positioned too close to the wall these hoops are difficult to use. Problem: Positioned too close to a mobility parking spot, this bicycle parking creates difficulties for both the mobility impaired and bike users. Problem: The position and alignment of the bikes indicates the direction and position these racks should have been installed in. Problem: Installed too close to the road and without any protection or buffer zone, this cycle parking has been hit. Individual parking BAYS are grouped in pairs either side of a shared STAND. Bays are accessed from an AISLE with parking bays on one or both sides. Note: bicycle handlebar widths vary greatly (550 – 700mm) and will be wider than the 500mm envelope shown. This is accommodated by spacing the racks and allowing adequate aisle and access widths between racks, and a layout that enables users to position their bikes effectively, e.g. top and tailing. In very busy locations an aisle of greater than 2.5m should be considered. Define the parking area – surface marking is useful for this purpose. Promote the presence of the bicycle parking. Explain how to use the bicycle stand (although preferable designs are self-explanatory). Bicycle lockers or enclosures, of which the purpose may not be immediately obvious, must have instructional signs. The standard sign to indicate bicycle parking is RP9, as specified in the Land Transport New Zealand Traffic Control Devices Rule. Refer to https://www.nzta.govt.nz/resources/roadcode/cyclist-code/about-signs/information-signs/ for more information. When bike parking has been well located, it should not require signage to find it. Directional signage should be installed at large sites such as town centres and bus stations in order to direct cyclists to secure bicycle parking. It should enable a first time visitor to easily locate the cycle parking regardless of their approach direction or entry point. Maps with cycle parking marked, painted lines or lanes leading to cycle parking, and directional signage can be used in combination to assist way-finding. This signage could also be incorporated in the car parking signs or as part of other Council or local branding. Problem: Located in an underground carpark with no directional or usage signage this bike parking goes unused by bikes and is used for trolley parking instead. E-bike charging. Residential, large public long-stay (e.g. airport parking areas), and private commuter cycle parking facilities should include amenity for charging e-bikes. avoiding steep ramps, speed humps, channelling, drainage grates or other hazards that are not suitable for traversing by bicycle riders. Location of boom gates (gap for cyclists), card readers, sensor loops and the timing and operation of automatic doors. Where possible, especially for short stay visitor parking, bike users do not like accessing multi level or underground car parks via vehicle routes. The number of movements and visibility within car parks make them hazardous places to cycle. Secure enclosures. Bike Parking cages or rooms should be securely locked with key or key-card access restricted to permitted users. Cage walls should be full height to the ceiling or a cage roof should be installed. Sliding gates are preferable for easy of use, ideally with an alarm which sound if the gate is left open. Users should be able to lock their bikes securely to immovable objects within the cage/room. Cargo bikes have larger space requirements and are becoming increasingly popular as they accommodate both cargo and passengers. 10% of parking should be suited to wider cycles, such as cargo bikes or mobility tricycles. Long-stay (>3 hours) bike parking should be covered and secured either physically or with high levels of active surveillance. Covered short stay bicycle parking is greatly preferred by users, and should be incorporated into design and location decisions wherever possible. Covered cycle parking is preferred for long-stay use. Addition of a pump and tool stand provides extra amenity to this bike parking installed into a concrete pad on the berm. Lighting is an essential element when expected usage extends beyond daylight hours. e-bike charging is available for visitors of Zealandia.